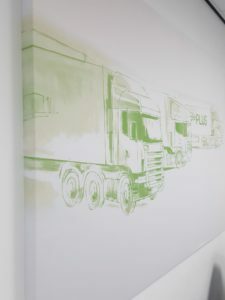 FreshPLUS is a service provision company based in rural Kent. They have serviced office suites for rental – recently one of these offices was fitted with bespoke wooden flooring which resulted in a small echo when multiple team members were using the room. FreshPLUS reached out to their in-house Graphic Designer to put together some stylish designs and Acoustic Pods supplied two large sound absorption panels which have successfully combated the problem of the echo. They have the added benefit of providing some modern artwork to the walls! 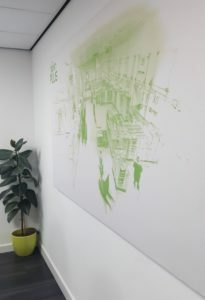 The largest panel was made at 2.1m x 1.2m and featured the clients unique artwork. The bespoke acoustic core of the wall panels provides a highly efficient sound absorber that can dissipate specific energy levels through friction, that help reduce sound reverberation.